The Semi takes Model S technology and puts in a big rig. At an event adjacent to SpaceX, the Tesla Semi (yes, that's its name) electric truck was introduced with the same pomp and circumstance the company uses for all its automobile launches. The tall, slick big rig follows the Tesla minimalist design language. The only protrusions are the side mirrors and a sensor array that resembles tiny wings situated at the top rear on either side of the truck. It looks like the future. CEO Elon Musk says it's "designed like a bullet." The Tesla Semi is exactly what you would expect from the company. An electric truck with a 500-mile range and a wealth of technology including Enhanced Autopilot. It also has a plethora of big rig-specific features like jackknifing prevention, sensors for blind-spot detection and data-logging for fleet management. But Tesla is no longer alone when it comes to electric vehicle announcements. Daimler, Cummins, and Toyota (the latter via hydrogen fuel-cells) all have prototype trucks that rely on electrons instead of gasoline for power. Meanwhile, Volvo showed off a hybrid semi-truck earlier this year. Other than Toyota -- which is already moving cargo in Los Angeles -- these trucks probably won't be on the road for a few years. Tesla announced that it'll go into production in 2019. 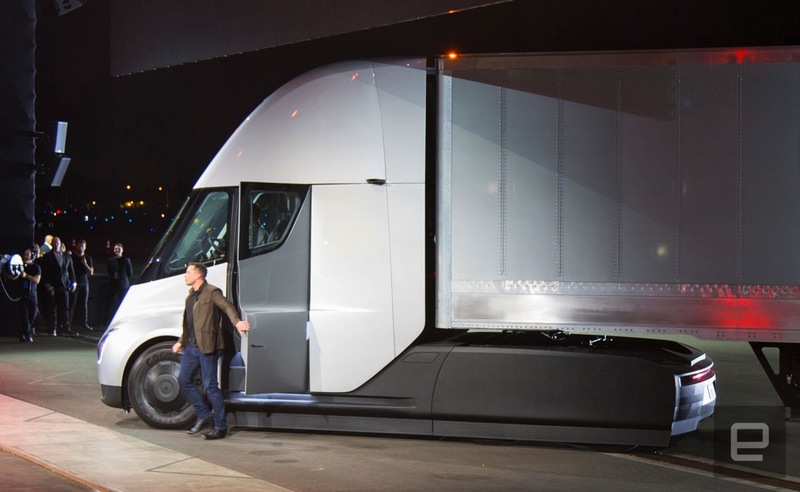 Tesla is also setting its truck apart from rivals by promising a recharge rate of 400 miles in 30 minutes via its new Megachargers. The Tesla Semi will travel up to 500 miles between recharging stops. In contrast Daimler's E-Fuso Vision One can cover up to 220 miles before it needs to stop. Musk said, "you can travel anywhere in the world via the Megachargers." They will be powered by solar panels and like the Supercharger network, will be built by Tesla. While passenger EVs are the main focus of most automakers, electrifying semi-trucks would go a long way to reducing pollution. According to the American Truck Association in 2014, trucks traveled 279.1 billion miles. In 2015, the EPA, noted that medium and heavy-duty trucks accounted for 23 percent of vehicle emissions. The Semi will have Enhanced Autopilot (automatic emergency braking, automatic lane keeping and lane departure warning) like the rest of the current Tesla lineup. It also has jackknife protection, sensors and cameras meant to reduce blind spots. The trucks interior is large enough to stand in (I'm six-foot three inches tall and my head didn't hit the ceiling. Like most big rigs, it has a set of steps on either side for easy entry and exit although these feel more like stairs than what's found on traditional large trucks. It also has a centered driving position which makes it slightly odd in the trucking world. Once behind the wheel, drivers will have two Model 3 displays on either side of the wheel with all the usual vehicle information that's in a regular Tesla on the right side (speed, mileage, battery status, maps, climate control, music, etc) and truck-specific info on the left. Thanks to the displays, other than the usual levers for lights and wipers found on the steering wheel stalk, the cabin is sparse. Oh also, the Semi has a zero to 60 of five seconds when empty and zero to 60 in 20 seconds when filled with 80,000 pounds of cargo. That's incredibly fast for a big rig. 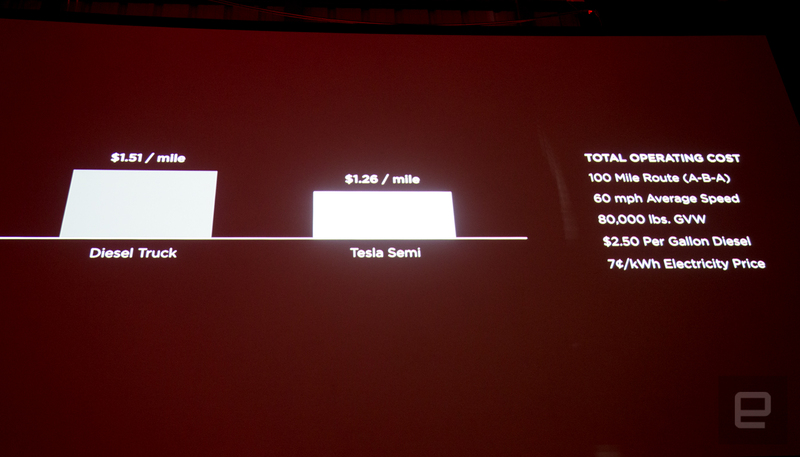 Also, Musk said Tesla will guarantee that the truck will not break down for a million miles. It's even cheaper per mile in a convoy scenario. If two of the motors die, the other two will keep the truck on the road. Tesla says that the truck is actually 25 cents less expensive than a diesel truck when you take into account insurance maintenance and other items. But no word on actual off-the-lot cost. All of the interior room is thanks to Tesla moving the drivetrain to the rear of the Semi behind the cabin. Four Model 3 motors with a slightly modified gearing ratios than what's found in the passenger car. Each of these is attached to their own wheel. Like other electric vehicles, there's no need to shift gears. The driver just steps on the accelerator and goes. Although there's very little chance the Semi will have Ludicrous mode. What it does have is a way for truck drivers to deliver their goods in a slick, easier to drive vehicle. As long as we keep ordering stuff from Amazon and other online retailers, we'll need big rigs. They're an important part of our economy that's typically overlooked. 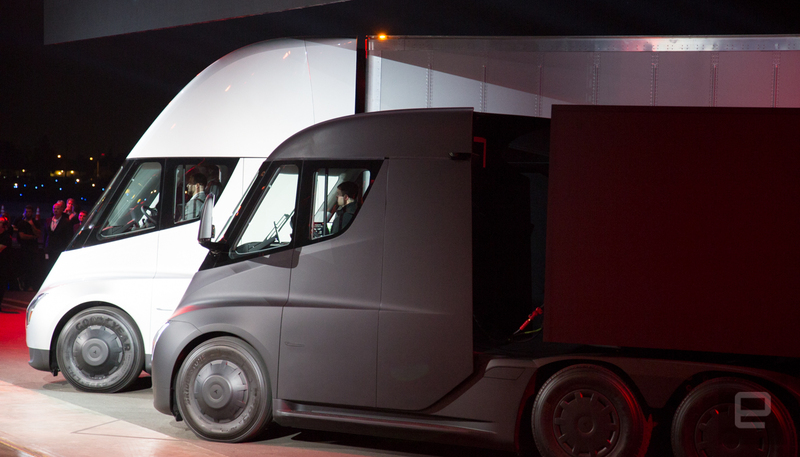 If Tesla can convince trucking companies that its offering is more cost effective because of the electric motors and connected fleet management capabilities than the traditional diesel vehicles on the road, that's a win for Tesla. But more importantly, it's a win for the environment.